I believe this was either the last dinner recipe created for Family Bites, with the help of my mom because I was at a loss. Using a variation of a salmon patty recipe, we decided to replace the salmon with tuna fish (basically coming up with a different way to use tuna outside of the traditional sandwich way) and adjust the flavorings other ingredients to suit our preference. Using Newman's Own Oil & Vinegar dressing, she also thought that a broiled topping would add a unique twist to the patties. Whipping egg whites and adding mayonnaise, yogurt, the dressing, and lemon pepper seasoning, you then dollop the mixture on top of the cooked patties and broil until browned. There's also a simple side dish of glazed carrots, also using the oil and vinegar dressing, as well as honey, salt, and pepper. 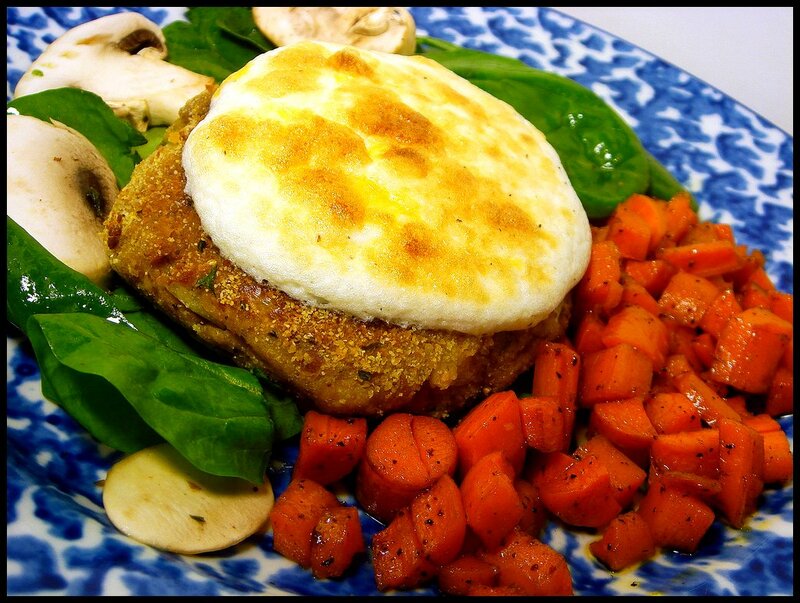 These moist, flavorful tuna patties are topped with a special broiled egg white-mayonnaise topping. Served with glazed carrots on the side. Heat oil and vinegar dressing over medium heat and add carrots, black pepper, and 1/4 teaspoon coarse salt.. Cook until tender, tossing occasionally. Add honey and cook for 3 minutes, or until liquid has slightly thickened. Check for seasonings. In large bowl, combine tuna, 1 1/4 cup bread crumbs and 1/4 cup cornmeal, eggs, mustard, horseradish, seasonings, and onion and parsley. Add reserved egg yolks from egg white topping if mixture is too dry. Shape into 8 patties. Mix remaining bread crumbs and cornmeal together and coat patties. Heat 2 tablespoons vegetable oil in skillet on medium. Fry patties until golden, about 3-4 minutes on each side, adding additional oil as needed. When cooked, place patties on rimmed baking sheet. While patties cook, mix together mayonnaise, yogurt, oil and vinegar dressing, and seasoning. Beat egg whites until soft peaks form and fold in mayo mixture. After patties have cooked, dollop with egg white mixture and broil on medium high until golden. Serve patties with carrots. Do the cooked patties have a firm enough texture so that they can be placed on a bun or english muffin? It seems like that would make a good sandwich.